The Bagh is a heritage hotel set in 12 acres two hundred year-old garden in Bharatpur Rajasthan, it is located just four hours away from major destinations such as Delhi, Jaipur and Gwalior. 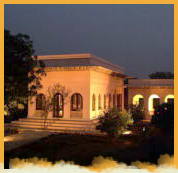 The Bagh offers visitors an opportunity to experience quiet luxury near Keoladeo Ghana National Park, one of the most famous bird sanctuaries in the world. The hotel's twenty three rooms are located in three different residential complexes. A restaurant, banquet hall, coffee shop, library and a gym, all situated in a verdant orchard, allow guests to enjoy solitude and companionship in restful indoor and outdoor spaces. Each of the Bagh's twenty three rooms is unique. Spacious bathrooms, luxurious fabrics, fine furnishings and the amenities of modern technology let the weary traveler retreat and recoup after a day of sightseeing and bird watching. Gulmohar, the main restaurant, specializes in the wonderful vegetarian cuisine of the Braj region. An ayurvedic massage or a lazy swim at the fully - equipped gym can further soothe and exhilarate the body and the mind. The Bagh garden complex has 2.5 kilometres of walkways for guests to stroll and discover the delights of nature and art. Mayur : The entrance block comprises of a reception area, a café and gift shop. The café offers a range of refreshing brews and delicious snacks. The gift sells a variety of art and craft items as well as local treats. Champa, Mogra and Gulab Bhavans : The three residential complexes comprise a total of twenty three spacious rooms, and have in-room entertainment. Other services such as laundry and wake-up call are available. Gulmohar : The restaurant specialize in Satvik vegetarian cuisine and delicacies from the Braj region, There is also a select offering of other dishes. Morchalli : Indoor bar serving Indian & imported liquor. Mahua : The outdoor bar serves an assortment of alcoholic and non-alcoholic and drinks with light snacks. Musicians perform for the guest's pleasure. Vintage Spot : The vintage garage houses three vintage cars, including a 1946 Chrysler Plymouth, a1918 Model T Ford and a 1938 ten Series III Morris as well as a Triumph 1938 motorcycles. Sheesham : recreational complex fully equipped gym and swimming pool. Ayurvedic message and other treatments are available at the spa. (Jacuzzi, Steam & Sauna Bath).